The technology in the AT&T Library and Technology Resource Center is available for use by University faculty, students and staff as well as non-profit organizations free of charge. This is governed by the campus Acceptable Use Policy. As a member of the Bridges Cluster within the MOBIUS library consortium, the library catalog is now accessible online from any computer with Internet access (http://bridges.missouri.edu/search~S3). This catalog links to the other nine Bridges Cluster's member catalogs as well as to the full MOBIUS compliment of member catalogs totaling more than 60 academic, special and public libraries across the state of Missouri and Tulsa, Oklahoma into one unified catalog. This MOBIUS catalog provides access to a total combined collection of more than 27,000,000 items, most of which can be requested by the enrolled students, faculty, and staff of Harris-Stowe State University. Once requested, these items are delivered within four to seven working days. Students, faculty, and staff can also visit other member libraries and check out materials directly by presenting their valid campus IDs, once their records are added to the library database. Students, faculty, and staff of other MOBIUS affiliates have reciprocal privileges. There is also a cooperative agreement with the Colorado Alliance of Research Libraries, providing access to library materials in Colorado and Wyoming. 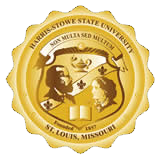 HSSU alumni and educators of the St. Louis area are entitled to borrow Harris-Stowe State University library materials and use the computers available in the library but are excluded from MOBIUS privileges. The AT&T Library and Technology Resource Center offers a variety of additional services which includes a Notary Public. These services are to support the academic mission of Harris-Stowe State University, its faculty, staff, and students. Resources are also available to non-profit community organizations for meetings, training and conferencing (some long-distance and security fees may apply). Please use the HSSU Online Room and Events Reservation System when requesting room reservations. The system is designed to streamline the reservation process for students, faculty, staff, as well as our external partners. Visit the following link: http://www.hssu.edu/rsp_content.cfm?wid=82&pID=1045 to access the HSSU Events landing Page. It can also be accessed by searching “EVENTS” from the HSSU homepage or from the Facilities Management – Facilities Request page.